Eric Carle fans, readers and artists of all ages will thrill to watch The Art of the Picture Book, a new film about the artist's life and creative process. 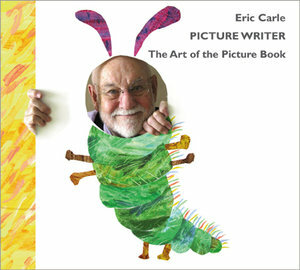 This intimate portrait lets every viewer into Eric Carle's world as if you were there beside him in his studio. Listen and watch as he creates his pictures, remembers his childhood, reflects on the creative life he has led for decades as the creator of more than 70 books for children. 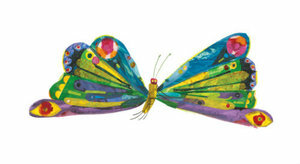 The Art of the Picture Book captures the magic of Eric Carle; a man who sees each child as an individual and who is deeply connected to the child he once was. Click here to watch a trailer! 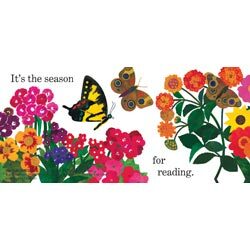 It's the season for reading. 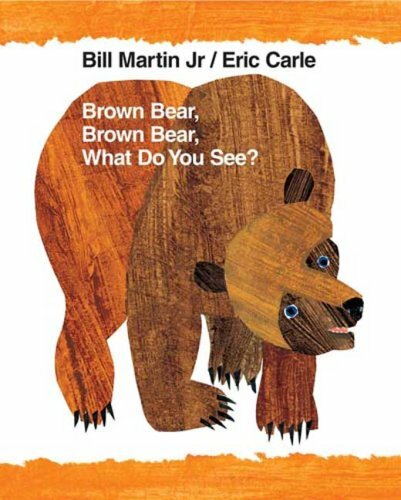 Carle is one of the most beloved illustrators of children's books. This retrospective is more than just an appreciation of his art, however. The book also contains an insightful autobiography illustrated with personal photographs, an anecdotal essay by his longtime editor, a photographic essay on how Carle creates his collages, and writings by Carle and his colleagues. Still, it is the artwork in the oversize volume that seizes the imagination. More than 60 of his full-color collage pictures are handsomely reproduced and serve as a statement of Carle's impressive talent. 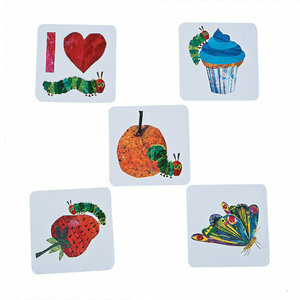 Set of 4 Eric Carle Very Hungry Caterpillar-themed crayons in an adorable mini box. Safe and non-toxic. Makes great party favors or classroom gifts! 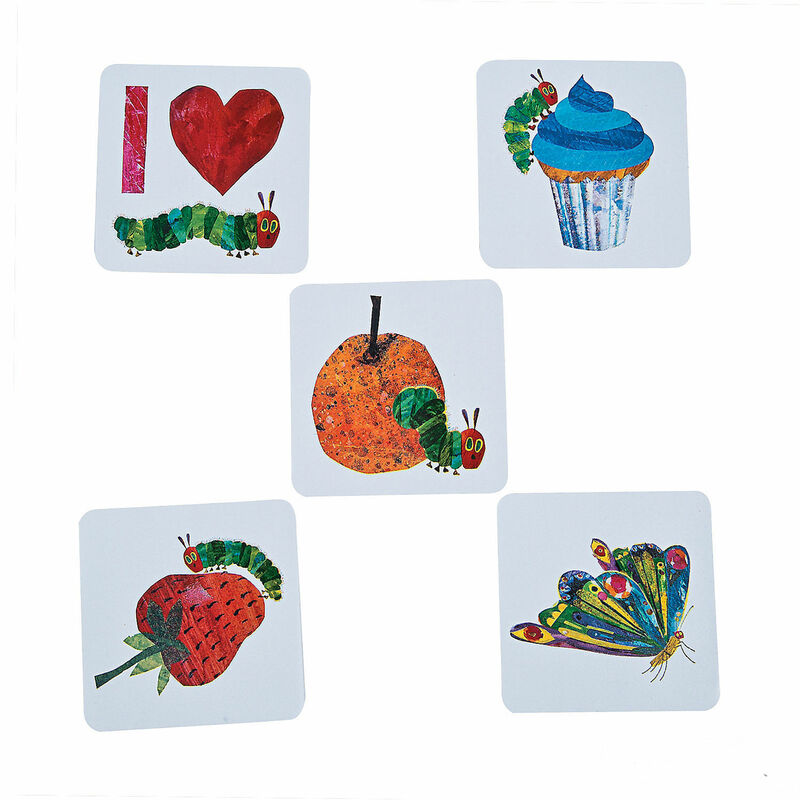 Set of 5 jumbo stickers featuring Eric Carle's The Very Hungry Caterpillar. Makes great party favors, stocking stuffers or classroom rewards. Each sticker measures 2.5" x 2.5"
The perfect size for little treats, gifts or a special thank you for guests of your party. Each pack comes with 8 paper party bags with a vibrantly green design with The Very Hungry Caterpillar and cheerful green grass design.Party Favor Bags measure 7.5 inches by 6 inches by 2.25 inches deep (dimensions exclude handles). Eric Carle s bright, appealing colors and memorable animal characters come to life in this charming decorative garland. 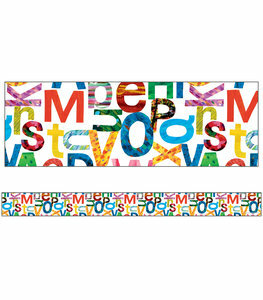 With 80 alphabet and animal tiles plus 5 yards of quality hanging ribbon, the user can spell out almost any greeting to create simple, playful decor for parties, play rooms, or bedrooms. WARNING: Possible entanglement injury. 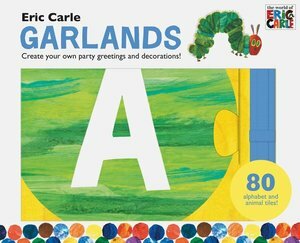 Keep garland out of baby's reach. Assortment of 36 mini Eric Carle temporary tattoos featuring favorite characters and iconic images from Eric Carle's most popular books! Each tattoo measures 1.5" x 1.5". Makes great party favors and stocking stuffers! Celebrate the sweetness of reading with this adorable poster featuring Eric Carle's Very Hungry Caterpillar. Poster measures 23" x 17". 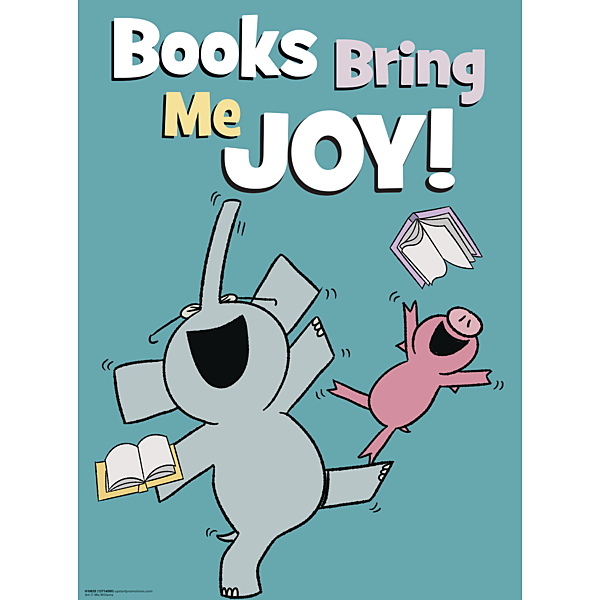 "Books Bring Me Joy!" poster featuring "ELEPHANT & PIGGIE" by Mo Willems. 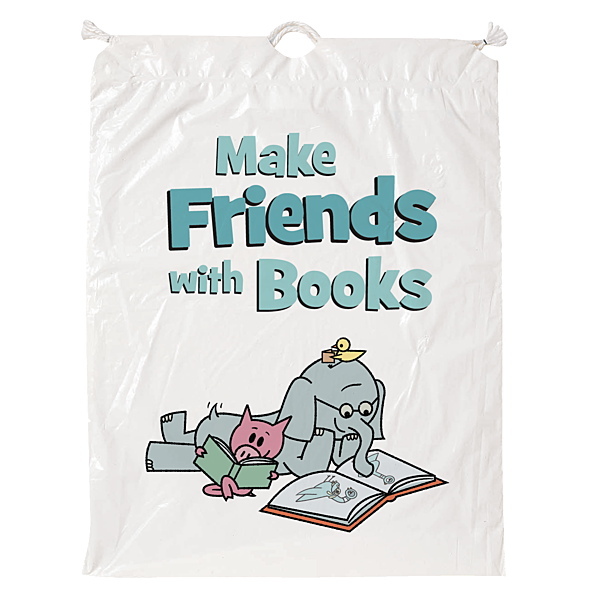 Perfect for your home, classroom or library! Measures 23" tall x 17" wide. "Make Friends with Books" Plastic drawstring bag featuring Mo Willems' "ELEPHANT & PIGGIE". Great for party favors! 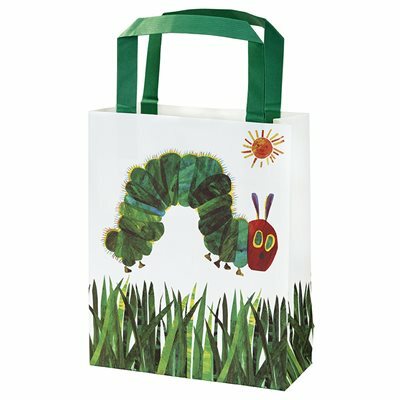 Bag measures 17" H x 14" W x 3" D.
Adorned with artist and author Eric Carle's illustrations from the book 1, 2, 3 to the Zoo, these beautiful flash cards feature three great subjects for infants and toddlers: animals, trains, and counting! 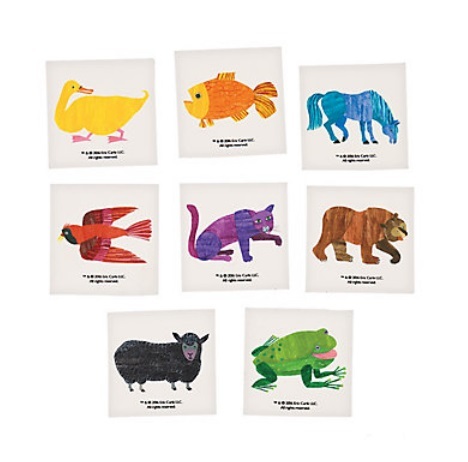 Printed on thick, sturdy board, they are equally suited for small hands to hold, hanging on the wall in a child's room, or making a number frieze in a classroom. The set of 20 cards counts from 1 to 10 twice. Highlight and frame any area of your classroom with the World of Eric Carle(TM) Letters Straight Borders. 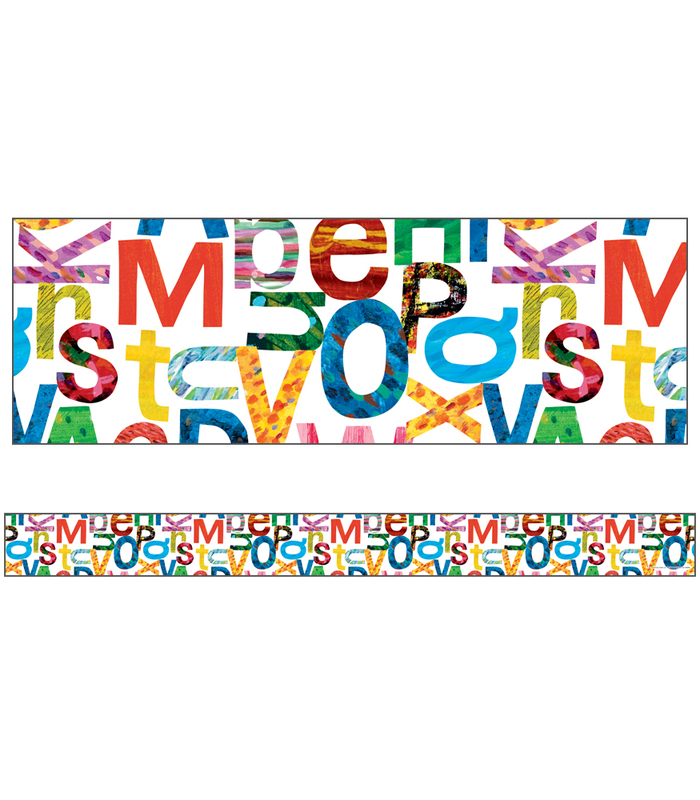 This 12-strip pack of borders is the perfect accent for bulletin board displays. Includes 31 pieces from Eric Carle's Slowly, Slowly, Slowly said the Sloth. Size of animal pieces vary and measure up to 24-3/4"H x 18"W.
Art Workshop for Children is not just another book of straightforward art projects. The book's unique child-led approach provides a framework for cultivating creative thinking and encourages the wonder that comes when children are allowed to freely explore the creative process and their materials. As children work through these open-ended workshops, adults are guided on how to be facilitators who provide questions, encourage deep thinking, and help spark an excitement for discovery. Children explore basic materials and workshops that use minimal supplies, and then gradually add new materials to fill the art cabinets as well as new skills and more complex workshops. Most workshops are suitable to preschool-aged children, and each contains ideas for explorations and new twists to engage older or more experienced artists. Interspersed throughout are sidebar essays that introduce perspectives on mess-making, imperfection, the role of adult, collaborative art, and thoughts on the Reggio Emilia method, a self-guided teaching philosophy. These pieces underscore the value of art-making with children, and support the parent/teacher/care-giver on how to successfully lead, question, and navigate their children through the workshops to result in the fullest experiences. Includes 12 storytelling pieces, largest 16" x 10.5", resource guide and book cover image. Fill with your child's favorite play things, such as toys, books and games! Features easy-to-grab handles and folds flat for compact storage. Its convenient size of 11" L x 11" W x 11" H fits into most shelving units. Also available in Ladybug and Caterpillar styles. Collect all three! Assortment of 36 mini Eric Carle temporary tattoos featuring favorite characters from Eric Carle's Brown Bear, Brown Bear, What Do You See? Each tattoo measures 1.5" x 1.5". Makes great party favors and stocking stuffers! 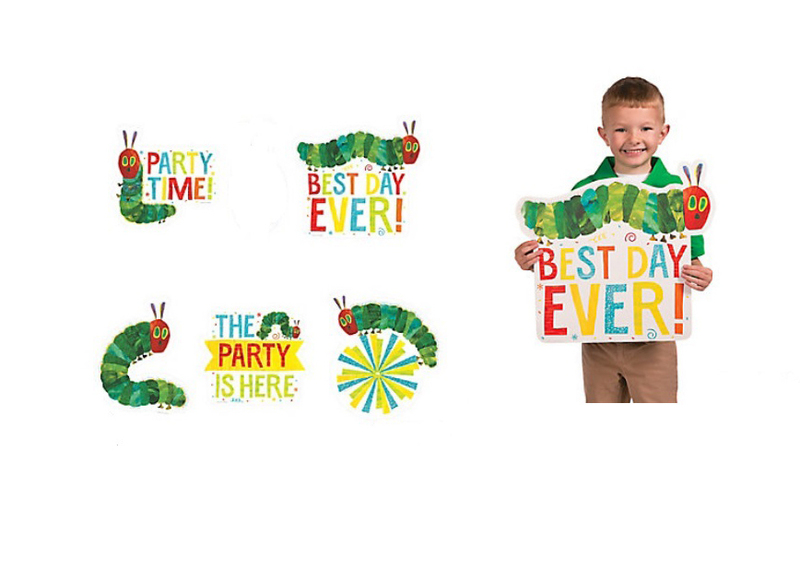 Decorate for your next big party with these jumbo die-cut illustrations! 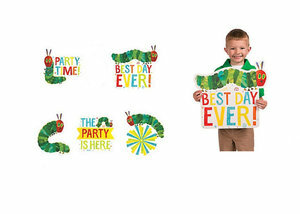 Featuring Eric Carle's Very Hungry Caterpillar and colorful phrases like "Best Day Ever!" and "Party Time!" these cut-outs are just what you need to add a festive flair to the walls, tables or windows. 5 cut-outs per pack. 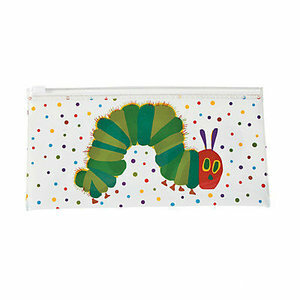 Cut-outs measure approximately 14" - 19"
Clear vinyl pencil case with zipper top featuring image of Eric Carle's The Very Hungry Caterpillar on one side and the colorful fruit he eats on the other side! Great for back-to-school gifts, party favors or classroom supplies! Pencil case measures 8" x 4". 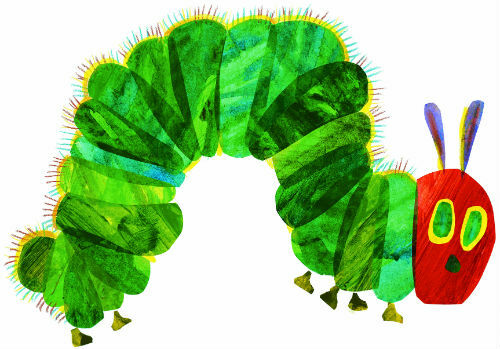 Celebrate Children's Book Week with the Very Hungry Caterpillar!